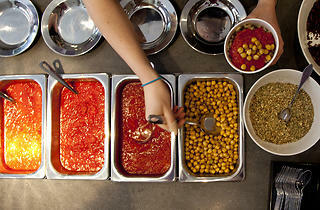 We’ll walk down Koshari Street any time: mega-filling, mega-tasty, mega-cheap. It’s the closest thing in the West End to a free lunch. London may have swooned for Ottolenghi and Yalla Yalla, but this homage to Egypt’s hole-in-the-wall koshari vendors, from food writer and champion of Levantine cooking Anissa Helou, is still a brave move. The small, pristine space with a stainless steel counter is slightly reminiscent of a school canteen: there are a handful seats along one wall. This is really a takeaway joint, with a menu only a shade more varied than it would be at a stall in Cairo or Alexandria. Warming, comforting and many-layered, koshari is falafel’s more substantial older brother – a solid, simple dish of lentils, pasta, vermicelli and rice topped with tomato sauce and fried onions. That’s it. Helou’s version comes in mild, hot and ‘mad’ (it’s not really), plus a twist of her own doqqa recipe – ground spices, nuts and herbs. Then there are a couple of plain salads, a daily soup (we had sharp, lemony lentil and chard with real depth of flavour), freshly pressed juices and traditional desserts – muhallabiyeh milk pudding and mishmishiya apricot purée, the former creamy and laced with rosewater like a grown-up version of a Wall’s Mini Milk, the latter an intense shot of fruit like a blast of summer sunshine. Service in the early days of opening was haphazard, but charming. Let them iron out the wrinkles, and London may swoon again for this simplest of Middle Eastern menus. A tiny place but really yummy food. Authentic and filling. A pot of grains,rice,tomatoes sauce,shawarma,crispy onions,it's a really good eat! It's great and worth a visit. Authentic Egyptian food in West End area. Small but cosy place to grab a box of super tasty Egyptian food in really good prices. For a quick lunch break or just after your theatre show, it is the ideal stop to have your hunger easily sorted! So delicious and satisfying!! Authentic Eygtian street food that is tasty, filling and excellent value. That said the falefal wrap was not so exciting so I would stick to what they specialise in next time!! …IF the food is good. Well kids, the results are in and y’know what? The food is fan-frickin’-tastically good. With one carbohydrate packed on top of another, Koshari is a traditional Egyptian street food and a total Atkins nightmare which automatically makes it something of a dream for me. Rice, lentils and vermicelli noodles with chickpeas, sweet, juicy & full-of-sunshine-ripe tomato sauce, fragrant herbs and crispy onions that I wanted to pluck out and eat with my fingers…I’m not joking when I say this was a tub of savoury, spiced deliciousness that I wanted to dive into and spend the next six hours eating my way out of. It’s filling, it’s warm, it’s spicy, it’s cannot-shovel-one-spoonful-after-another-in-quick-enough-delicious and thankfully, each grain has been cooked well enough that they’re distinguishable from the others and don’t disappear into one big gloopy mess. My eyes are always bigger than my stomach – a badge I wear with pride nowadays – so I will warn you and say that a large is generous. Don’t eat before you go and don’t plan on eating for at least eight hours afterwards. You can choose from mild, hot or mad spice levels meaning there’s something for every level of food adventurer and if you opt for a small koshari, you can pad out your meal with one of their freshly made soups or wholegrain salads. The menu might be small but the ingredients are sourced from mighty suppliers including Brindisa, The Spicery and Neal’s Yard Dairy. The place itself is small with only 8-10 stools along the wall opposite the counter but being in the beating heart of Theatreland means that there’s no shortage of places to perch outside. Our mid-afternoon visit saw us arriving around 2.30pm to find a few others waiting, a quick and professional service and two free seats upon which we sat to placate our grumbling tummies. Don’t go for a long, lingering lunch and a so-hip-that-it-hurts vibe; there are other places for both of those but this is the spot for fast food done cheap and done right. If you don’t have the same sort of food addiction issues that I clearly do, you may find my adoration of this tiny pocket of Egypt somewhat excessive but that’s ok. When you go and when you agree, I promise I’ll only say ‘I told you so!’ with the smallest modicum of smugness. Just so freaking good every time. 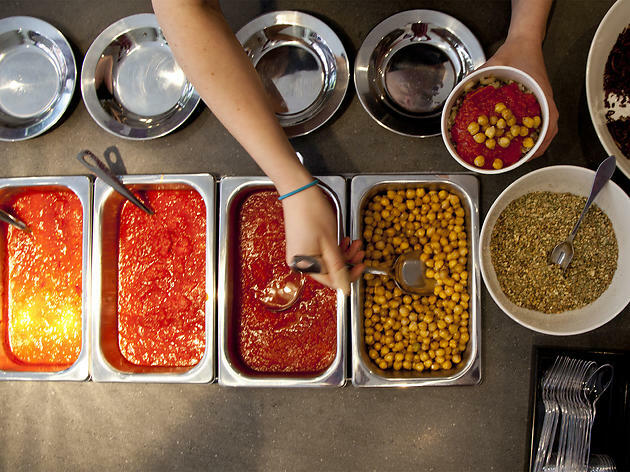 Their koshari pots consist of lentils, rice and vermicelli topped with chickpeas, herbs, tomato sauce (in a variety of heats) with crispy caramelised onions on the top. They also do some specials that contain meat but in my opinion you can't beat the original. I am a huge fan of their combo deal where you get a koshari pot, a side of your choice (salad or pudding) and a drink. Last week I tried the Muhallabiyeh a beautiful blend of thickened jersey milk flavoured with orange blossom topped with pistachios, super duper. Dining in is a squeeze as there is minimum space along the right handside but there are plenty of places to sit and eat nearby. Love, love, love Koshari! It's my fallback for a rainy day when all you want is carbs and somewhere I eat often before the theatre. It's cheap, healthy and always delicious. A great place to come with vegetarian/vegan friends, I hope Koshari has a long lifetime on St Martin's Lane. I have been here a few times now. The food is nice and simple and honest. It comes with three different types of sauces Mad, Hot and Mild. They also come in three different tub sizes. Lots of carbs, It is all topped with Fried onions which gives the food the special taste. During lunch time you can find a bit of queue, although on more than one occasion, there was just one person serving and a huge queue waiting outside in the rain. I would like to think it is a one of thing, but the food is nice and cheap. (between £6 to £7) for the largest tub size. The eat-in space is a bit too crambed, so may not suit a large crowd. Addictive doesn't cover it. The mix of carbs, carbs and more carbs is comforting and delicious. It's such a simple dish but the seed mix and sauce really make it. On my first visit, I got the Hot sauce which was extremely mild. The next time I got Mad which literally made me cry. I then went back to Hot again and it was pretty damn spicy. It seems to me that the spice level is a bit of a gamble but even if your tongue is a bit numb after eating, you still would have had a great time.